This genus is accepted, and its native range is Tropical & S. Africa to Tropical Asia. Flora Zambesiaca. Vol 8, Pt 7. Avicenniaceae, R. Fernandes. 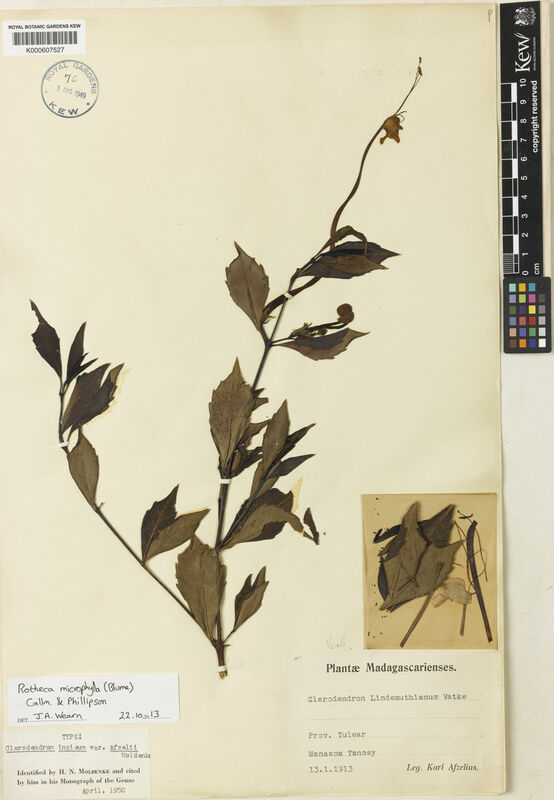 Nesogenaceae, M.A. Diniz. Verbenaceae, R. Fernandes. Lamiaceae, R. Fernandes. 2005. Inflorescences terminal or axillary, with flowers in lax or ± dense cymes, the cymes racemosely, corymbosely or paniculately arranged Inflorescences terminal or axillary, with flowers in lax or ± dense cymes, the cymes racemosely, corymbosely or paniculately arranged. Calyx usually red or purple, campanulate to subspherical, ± deeply (4)5(6)-lobed, usually persistent and slightly accrescent in fruit; the lobes acute to rounded Calyx usually red or purple, campanulate to subspherical, ± deeply (4)5(6)-lobed, usually persistent and slightly accrescent in fruit; the lobes acute to rounded. Corolla predominantly blue to whitish, asymmetrical in bud, distinctly zygomorphic when open; tube relatively short and broad, anteriorly gibbose; limb 5-lobed with 2 posterior lobes subequalling 2 lateral lobes and 1-anterior lobe larger than the others, concave or spoon-like and often coloured differently Corolla predominantly blue to whitish, asymmetrical in bud, distinctly zygomorphic when open; tube relatively short and broad, anteriorly gibbose; limb 5-lobed with 2 posterior lobes subequalling 2 lateral lobes and 1-anterior lobe larger than the others, concave or spoon-like and often coloured differently. Fruit a 3–4-lobed drupe or drupaceous schizocarp, obovoid or globose; mesocarp ± fleshy; endocarp bony or crustaceous; each lobe containing a 1-seeded pyrene; seed without albumen. Fruit a 3–4-lobed drupe or drupaceous schizocarp, obovoid or globose; mesocarp ± fleshy; endocarp bony or crustaceous; each lobe containing a 1-seeded pyrene; seed without albumen. Leaf lamina usually broadest above the middle, usually discolorous and whitish or yellowish tomentose beneath; branches often densely hairy or tomentose towards the apices; short lateral flowering branches often present Leaves simple, opposite-decussate or 3–4-whorled, usually petiolate; lamina entire, undulate, dentate or crenate, distinctly acrid when crushed Leaves simple, opposite-decussate or 3–4-whorled, usually petiolate; lamina entire, undulate, dentate or crenate, distinctly acrid when crushed. A genus of 26–30 species, widespread throughout sub-Saharan Africa, with 1 species in tropical Asia eastwards to the Moluccas, and one species introduced and naturalized in Madagascar and the Indian Ocean islands. Perennial herbs or suffrutices with woody rootstocks, sometimes geoxylic, shrubs, sometimes scandent, or small trees. Style terminal, slender, ± equalling the filaments; stigma 2-fid, the lobes usually unequal. 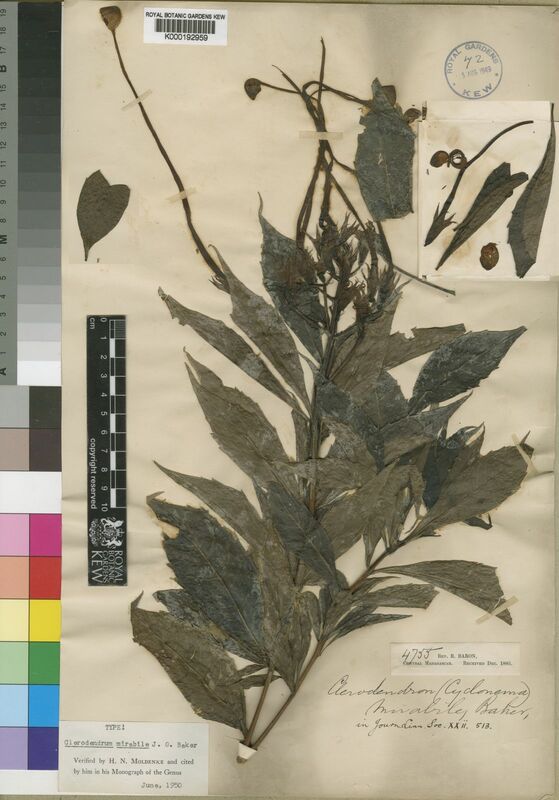 Rotheca commiphoroides (Verdc.) Steane & Mabb. Rotheca luembensis (De Wild.) R.Fern. Rotheca macrostachya (Turcz.) Leerat. & Chantar. 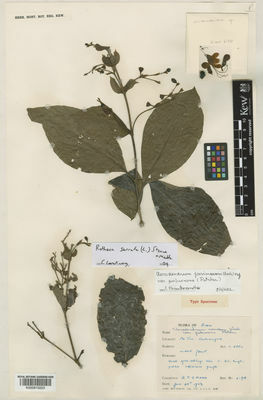 Rotheca makanjana (H.J.P.Winkl.) Steane & Mabb. Rotheca myricoides (Hochst.) Steane & Mabb. Rotheca sansibarensis (Gürke) Steane & Mabb. Rotheca serrata (L.) Steane & Mabb. Harley et al. in Kadereit (ed. ), Fam. Gen. Vasc. Pl. (Kubitzki, ed. in chief) VII: 198 (2004). Kadereit (ed. ), Fam. Gen. Vasc. Pl. (Kubitzki, ed. in chief) VII : 198 (2004). Kew Bull. 55 : 147–154 (2000). R. Fernandes & Verdcourt in Kew Bull. 55: 147–154 (2000). Novon 8 : 204–206 (1998). Steane & Mabberley in Novon 8: 204–206 (1998). Fl. Tellur. 4: 69 (1838).